I am an evolutionary geneticist at the University of Hull, UK. My lab uses phylogenetic and bioinformatic approaches to better understand genomes, evolutionary processes, and biodiversity. My lab is part of the University of Hull Evolutionary Biology Group and investigates problems in evolutionary genetics using DNA and bioinformatic technologies. I’m interested in comparative genomics, large scale phylogenetics and molecular evolution. I’m particularly interested in the way in which the evolutionary forces of recombination, selection, mutation and drift influence genomic content. We also work on projects using phylogenetics and DNA barcoding to better understand biodiversity and the speciation process. Please also see the Research page. 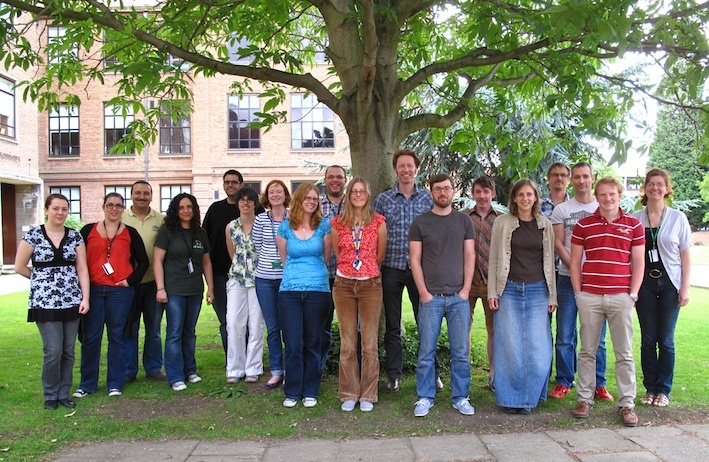 Evolutionary Biology Group July 2011. From left to right: Jo Baker, Carla Olmo, Abdul Hamza, Marta Maccari, Chris Venditti, Africa Gomez, Lori Lawson Handley, Lesley Morrell, Steve Moss, Marlene Jahnke, Dave Lunt, Tom Mathers, Paul Nichols, Domino Joyce, Bernd Hanfling, Mark Culling, Dan Jeffries, Andrea Simon.